London Falling is an urban fantasy novel set in the most fantastical city in the world - London. There is really no other city as suitable and rich for urban fantasy as London. London Falling is also a police story, with a small squad of police at its heart. Our protagonists are two undercover agents, their supervisor and a backroom techie. The novel starts as a multi-month operation is about to come to its end, on New Year's Eve. The mob boss they've been trailing is frantically taking his crew around different houses, while the higher ups in the police have scrapped their operation's budget, so they need to make their arrest that night, irrespective of whether they have enough evidence to make prosecution viable or not. The pressure is on. There are tensions in the team - or rather, they are really not a team at all yet. Instead, they are four people who work on the same project, but rarely together and each laden with resentments towards some or all of the others. The mob boss, meanwhile, is coming to the end of a ten year reign of unimpeachable crimes, having taken over every other gang in his territory without ever getting into a bloody war. He's used his private room to do so, and there is an air of secrecy around his working methods. No one, not his closest allies, have any idea how he did what he did. As it's an urban fantasy, you might guess that the supernatural is involved. Things very quickly spiral out of hand, and our crew of coppers spend the rest of the book trying to adjust to a new perspective on the world, trying to become a well-functioning team, but, most of all, trying to catch and eliminate a major baddie. 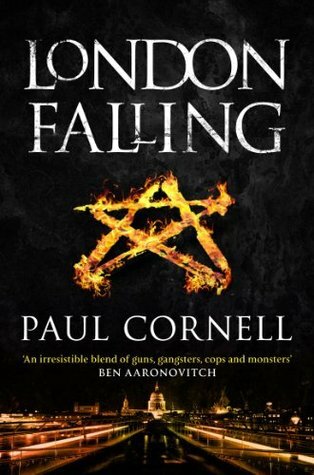 London Falling differs from Ben Aaronovitch's magical London police procedural in tone (it does not go for 'funny') and in approach (there is no wise magical mentor, just four police officers trying to learn as they go). It's very much a thriller, with heavy doses of peril, gruesome crimes, and gut-wrenching plot developments that damn near made me tear up at one point. It does take a while to find its feet, and some of the personal histories / demons of the characters felt a smidgen by-the-numbers. The supernatural London also differed from that in other books in being almost entirely sinister - a thing to be feared. While this worked well in terms of creating an atmosphere or peril, it deprived this London of complexity. To draw comparisons: Hellboy 2 is a much superior movie to Hellboy for many reasons, but one of the big ones is that in the sequel, a very richly drawn supernatural coexists with the mundane, and we get glimpses of an otherworld that is not just full of monsters, but filled with the magical everyday, with non-human characters living independent lives, especially in the Faerie Market. It is that sort of perspective which is missing in London Falling (as it was also largely missing in the first Hellboy movie). London Falling is a good, entertaining, thrilling read. It's a lot darker than other recent offerings of urban fantasy, with heavy elements of horror. I have high hopes for the series as it develops, but this is definitely a satisfying start.